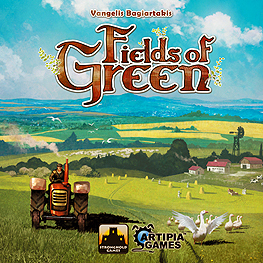 Fields of Green is played over four rounds during which players draft cards and add them to their ever-expanding farms. At the end of each year comes the harvest season when they must water the fields, feed their livestock, and pay maintenance costs in order to receive valuable resources that will allow them to further expand in the next year. Through various means, players eventually convert their wealth to victory points, and the one who gathers the most by the end of the game is the winner. Cards: These are made of decent cardstock and the artwork is superb, though more space could have been given to the writing section for an easier read. The equipment tokens, Card stack markers, turn marker etc. all of decent stock. The turn marker and first player token are very thematic. The artwork on the equipment tokens is also of good standard. The wooden tokens are very nice but a little on the tiny side to pick up easily. I have played this several times now 2-player, as well as 3 players. The 2-player variant for the drafting part of the game works extremely well and is a brilliant twist on the usual format so well done there. The game comes with some excellent play-aids in the box which help as a great reminder for players. There is also a guide giving suggested drafts for your first game, this is very useful for first time players. There are and will be several reviews that will go into detail on how to play the game so I will not repeat that again here but just to mention at its heart this has a card drafting mechanic with various options on how you play those cards. The idea is to build your farm maximising your chances to score points at the end of the game by creating an efficient engine utilising instant and ongoing abilities on cards. Getting this right is key to making your farm score better than your opponents. The drafting mechanism means having to make harsh choices knowing that some of the cards you pass on will aid your opponents. One key element is knowing when to start drawing the Building cards which comprise end game scoring. Whilst these provide a chance to work towards a scoring opportunity they are expensive to build so you may end up helping an opponent if you can’t build any you draw. This is a slick game which provides some meaningful choices and requires a degree of planning coupled with keeping an eye on what the other players are building in their farms. This is a solid, well designed game which has plenty of replayability as no two games will be the same. The vast array of different cards make for some different and interesting combos each time you play meaning you have to adapt your plans as you play. This has been a great addition to my collection and has earned it place with multiple plays since purchase with many more to come. I would have no hesitation on recommending this game to anyone, despite the few niggly points mentioned.